The N.B.A. is appealing an effort by the Knicks to achieve “early Bird” rights for Jeremy Lin and Steve Novak. A dispute between the N.B.A. and the players union over Jeremy Lin’s so-called Bird rights could spill into July, clouding the Knicks’ free-agency agenda and creating potential chaos for all parties. The arbitrator's ruling means Jeremy Lin will be able to re-sign with the Knicks without respect to the salary cap, for a starting salary around $5 million. An arbitrator on Friday ruled that Lin was entitled to his “early Bird” rights and thus eligible to re-sign with the Knicks without the use of other salary-cap exceptions. 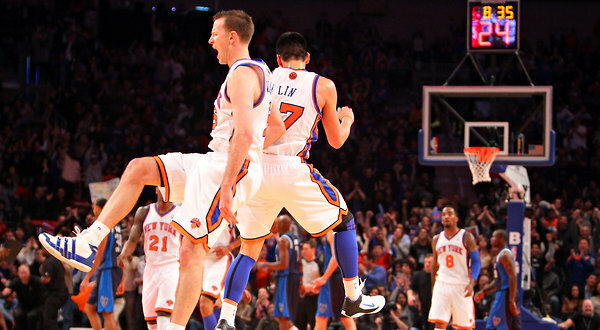 The ruling also applied to the Knicks’ Steve Novak who, like Lin, was claimed off waivers this season. It was a victory for the union and, by extension, the Knicks, who stood to benefit from the added payroll flexibility. But the celebration was short-lived. The N.B.A. later announced that it would appeal the ruling — a process that could take days or weeks. Free agency opens July 1. The league has 10 days to file its appeal. Once it does, league and union officials must agree to a three-member panel. A hearing would be held, and the panel would have up to 30 days to issue a decision. In the meantime, the Knicks could be hamstrung by the uncertainty. If Lin and Novak have their early-Bird rights, the Knicks could re-sign both players and save their midlevel exception (worth about $5 million) for another free agent. But if the Bird rights are lost, the Knicks would have to use the midlevel exception to keep Lin. They would very likely lose Novak, as well as any chance to lure a top-flight free agent, like Ray Allen or Steve Nash. The union will push to have the dispute resolved by July 1, either through an expedited appeal or through a direct settlement with the N.B.A. It is unclear whether the league is open to settlement talks. Although teams and players can begin contract talks July 1, no deals can be signed until July 11, which could give the parties a slight buffer period to resolve the issue before it affects the Knicks’ decisions. Bird rights, which are earned by spending two or more years with the same team, and allow a player to re-sign without respect to the salary cap. Those rights transfer with a player when he is traded. But in the league’s view, those rights are lost when a player is waived. In the ruling issued Friday, the arbitrator Kenneth Dam, a professor of law at the University of Chicago, agreed with the union’s position: that players claimed on waivers should be treated the same as traded players and keep their Bird rights. “Bird and early Bird rights are the linchpin of our soft-cap system, and we’re pleased that Professor Dam recognized that a player does not forfeit these important rights unless he makes an affirmative decision to sign with a new team as a free agent,” Billy Hunter, the union’s executive director, said in a statement. A player with early-Bird rights is eligible for a salary starting at the league average, about $5.3 million. A player with full Bird rights can sign for up to the maximum salary. The case also affects Chauncey Billups of the Los Angeles Clippers and J. J. Hickson of the Portland Trail Blazers, who were also claimed off waivers last season and who were granted full Bird rights under Dam’s ruling.